The new talent keeps coming thick ‘n’ fast at Ramblin Man Fair 2019. The festival is very pleased to showcase and support the new wave of UK and international classic rock – an organic, and multi genre scene that is very much alive and kicking and producing some stunning acts. Former Rising stage star Kris Barras will make his Main Stage debut along with The Lazys on Friday night. A rare and very special treat for all fans of American classic rock as the Allman Betts Band make a welcome return to the UK to join us on the Outlaw stage. 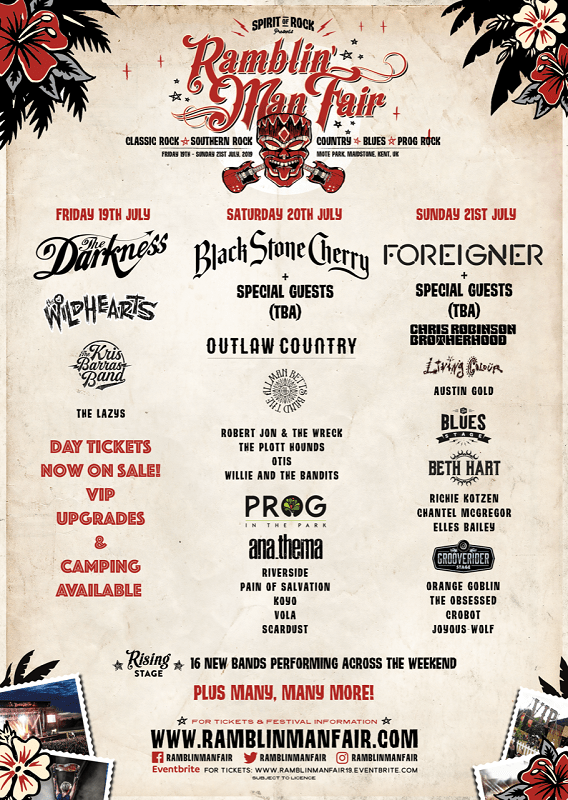 Also on Outlaw, alongside the previously announced Robert Jon & The Wreck and Minesotta’s Plott Hounds, will be the fast rising Wille & The Bandits plus Black Stone Cherry favourites, and the soon to be huge, Otis. Over on Prog stage the discoveries continue as you prepare to be transported to different worlds by the unique sounds of the sublime VOLA & the festival debut of the theatrical Scardust. As Sunday rolls around we start the day with Planet Rock Radio approved rockers Austin Gold who open up the main stage plus the magnificent Joyous Wolf (on Grooverider) and the supremely talented Elles Bailey and Chantel MacGregor tear up the Blues stage. The cream of new acts join those already announced bands including Rock legends FOREIGNER (Sunday’s Planet Rock Main Stage Headliner), BLACK STONE CHERRY (Saturday’s Planet Rock Main Stage Headliner), American blues singer/songwriter BETH HART (Blues Stage Headliner), Prog in the Park HeadlinerANATHEMA, THE DARKNESS (Friday Planet Rock Main Stage Headliner), THE WILDHEARTS (Friday Main Stage Special Guest), LIVING COLOUR(Main Stage), KOYO (Prog in the Park Stage), ORANGE GOBLIN(Grooverider Stage), CROBOT(Grooverider Stage), OBSESSED (Grooverider Stage), ROBERT JON AND THE WRECK (Outlaw Stage) and CHRIS ROBINSON BORTHERHOOD as well asmore prog acts including Swedish act Pain of Salvation and polish prog giants Riverside.